Department of Obstetrics and Gynecology, Khoula Hospital, Muscat, Sultanate of Oman. Address correspondence and reprints request to: Tahira Kazmi, Department of Obstetrics and Gynecology, Khoula Hospital, Muscat, Sultanate of Oman. Labour: A Review. Oman Med J 2011 Nov; 26(6):459-460. Recording the fetal heart rate has been standard practice for more than 159 years. The wooden Pinard’s stethoscope was the first technology to be introduced and its modern version is still in clinical usage in under developed countries. However, it only provides information on the number of heart beats per minute. Electronic fetal monitoring was developed with the introduction of Cardiotocography (CTG) technology,1 which rapidly gained clinical acceptance. It was believed that the provision of continuous information would enable clinicians to detect babies exposed to oxygen deficiency. for wrong or delayed action. To improve the scenario, recent development is invention of The STAN system (ST Analysis, Neoventa Sweden). STAN is a system for fetal surveillance that displays the FHR and information resulting from the computerised analysis of ST interval of the fetal ECG.6 This system is based on ECG changes determined by the myocardial adaptation to oxygen deficiency. muscle cells will therefore produce changes in the ST interval of the fetal ECG. The ST interval,8 consists of the ST segment and the T-wave. A normal fetal ECG ST interval is characterized by a horizontal or upward sloping ST segment and a T-wave with constant and stable amplitude. A normal ST interval usually indicates a fetus capable of coping with the stress of labor. During oxygen deficiency or Intrapartum hypoxia, in the heart muscle cells, anaerobic metabolism is initiated in order to sustain energy production and myocardial function. The breakdown of glycogen initiates the release of potassium ions, which causes an increase in the T-wave height. The T-wave increase is an indirect measurement of glycogen utilisation in the heart muscle cells. ST depression and negative T-waves are other significant ST changes that basically indicate a situation of compromised cardiac performance. Therefore, ST analysis is based on the ability to detect changes in the ST interval when the fetus defends itself from hypoxia during labor. The STAN machine consists of a monitor showing the fetal CTG and analysis of fetal ECG continuously. It is non invasive system attached to the fetus by fetal scalp electrode just like the fetal scalp electrode of CTG machine. A single spiral fetal scalp electrode records the total ECG,9 signel necessary for ST analysis and CTG at the same time. The fetal ECG signal is automatically recorded, processed and analysed by the STAN system and results are shown on the screen. 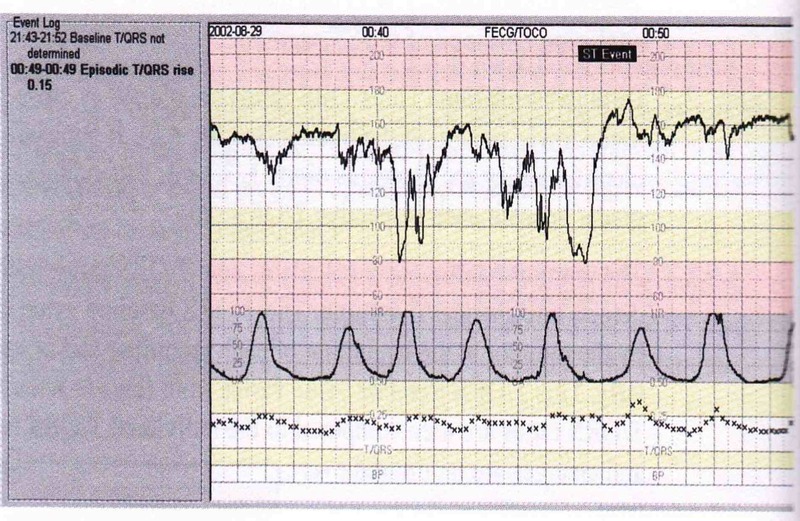 When the monitor detects any significant change in the ST interval, these are displayed as “ST events” on the main screen.10 These ST events are considered to be pathological but their analysis is indicated as an adjunct to CTG monitoring to determine whether obstetrical intervention is needed or not. A number of studies,6,7,8,9 have been done on benefits of STAN system and it has been observed that as interpretation of CTG faces huge inter and intra observer variations, STAN interpretation gives extra information regarding fetal distress. Prediction of fetal distress depending upon CTG creates more difficulties for labor ward staff, as many of the times; Cesaraian sections done for fetal distress do not match with babies born with good apgar score. On the other hand, babies born with low apgar score and diagnosed to have metabolic acidosis show failure of diagnosis in labor depending upon CTG. Confirmation of hypoxia can be done by fetal scalp blood sampling during labor but it is not practiced widely. To overcome the difficulty felt for the diagnosis of Intrapartum hypoxia, STAN system has been added to CTG so one has to interpret both at the same time. There are 2 aspects to the guidelines: firstly, that it includes both CTG interpretation and classification; and secondly, that clinical action is recommended based on the combined assessment of the CTG classification and ST events. When CTG changes occur, the ST analysis provides additional information about the severity of the stress and the clinical guidelines indicate where intervention is recommended. The guidelines are not intended to replace individualized clinical judgement and decision making. Figure 1: ECG Complex showing normal ST interval. Figure 2: View from Stan Machine Monitor showing the CTG, Uterine contractions and Fetal ECG Analysis in the form of QRS Complexes. Fetal surveillance in labor relates to basic acid base biochemistry as well as to modern computing and artificial intelligence. Only by working towards improved understanding of mechanisms involved with fetal reactions, or lack of reactions, would we be able to reduce ambiguity, improve and resolve negligence and medico-legal issues. ST analysis of the fetal ECG has been through a rigorous development progress that delivers improved care in perinatal centres keen to participate and adapt. As with all methodologies, nothing is achieved by a piece of machinery, it is the educated monitor using the machinery that makes the difference. Figure 3: Aerobic and Anaerobic Metabolism. 1. ACOG Practice Bulletin; Intrapartum fetal heart rate monitoring.2005:62. 2. Alfirevic Z, Devane D, Gyte GML. Cochrane collaboration:Continous CTG as a form of EFM for fetal assessment during labour[Review]. The Cochrane Library 2006,issue 3. 3. Nelson KB. Can we prevent cerebral palsy? N Engl J Med 2003 Oct;349(18):1765-1769. 18. 4. Bernardes J, Costa-Pereira A, Ayres-de-Campos D, van Geijn HP, Pereira-Leite L. Evaluation of interobserver agreement of cardiotocograms. Int J Gynaecol Obstet 1997 Apr;57(1):33-37. 5. Donker DK, van Geijn HP, Hasman A. Interobserver variation inthe assessment of FHR recording. Eur J Obstet Gynae Reprod Bio 1993;52(1):21-28. 6. Amer-Wahlin I, Arulkumaran S, Hagberg H, Marsál K, Visser GH. Fetal electrocardiogram: ST waveform analysis in intrapartum surveillance. BJOG 2007 Oct;114(10):1191-1193. 7. Amer-Wåhlin I, Ingemarsson I, Marsal K, Herbst A. Fetal heart rate patterns and ECG ST segment changes preceding metabolic acidaemia at birth. BJOG 2005 Feb;112(2):160-165. 8. Amer-Wahlin I, Yli B, Arulkumaran S. Fetal ECG and STAN technology-a review.EurClinicsObstet Gynacol.2005 june 17;published on line. 9. Neilson JP; The Cochrane collaboration. Fetal ECG for fetal monitoring during labour. Cochrane Libr 2006;3. 10. Rosén KG, Amer-Wåhlin I, Luzietti R, Norén H. Fetal ECG waveform analysis. Best Pract Res Clin Obstet Gynaecol 2004 Jun;18(3):485-514. 11. Amer-Wahlin I, Dekker S. Fetal monitoring–a risky business for the unborn and for clinicians. BJOG 2008 Jul;115(8):935-937, discussion 1061-1062. 12. Sunstrom A-K, Rosen KG. Fetal Surveillance.2000.Neoventa Medical AB.www.neoventa.com.